When the Marantz PMD620 flash recorder was announced a few days ago we didn’t have too many details to share. That hasn’t stopped people from talking though. Boing Boing, Gizmodo, and other popular gadget blogs have weighed in on the compact prosumer device. 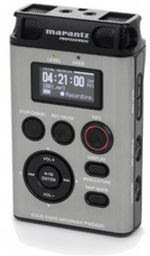 “Skip back” feature lets transcribers review audio recorded from 1 to 60 seconds go (we assume this means while you’re still recording, which means this could be an ideal device for anyone who needs to transcribe audio in real-time, like courtroom reporters). Display can be set to show time remaining, elapsed time, or other important numbers. Now if we could just get a picture of this thing in someone’s hand, or better yet, side by side with a Zoom H2. The Marantz PMD620 will be out in November, and will set you back about $400. That’s twice the price of the H2, but it looks like the Marantz has a few features the H2 doesn’t, like a better display, Skip Back, on-board editing, and support for massive SD cards. Of course, the things that matter most to me are how noisy the preamps are, how clean the audio recorded with the internal mics sounds, and the ease of use. All the rest is gravy. And until we start to see some hands-on reviews, we won’t know how the PMD620 stacks up against the H2, the H4, or even the PMD660. Hi, it would be interesting to compare it with the new Sony PCM D50….